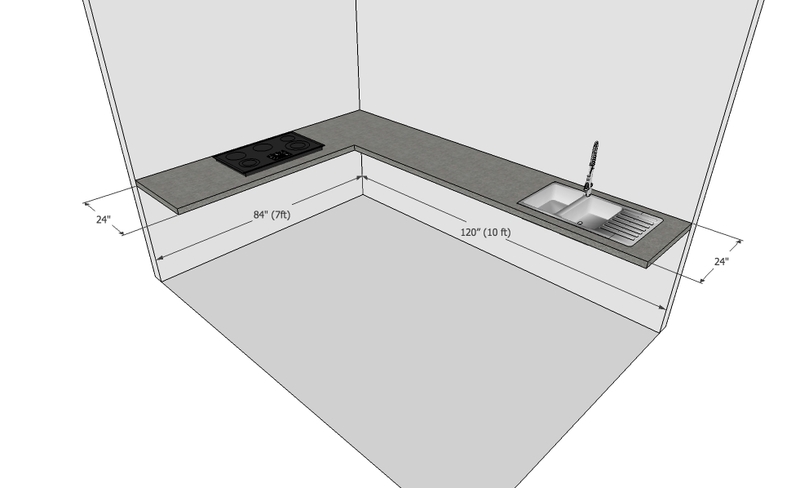 Step 2: Measure the depth of the counter. Step 4: Take a pencil and piece of paper to draw a 2D project of the counter as given below. Also, mark the position of the sink. Step 5: Cut out the corners by drawing perpendiculars from both the sides. Note that I have cut off 2ft from both the sides in the corner. After doing this, the entire space has been broken down to different sub-spaces as given in the diagram. Now we have 4 spaces. 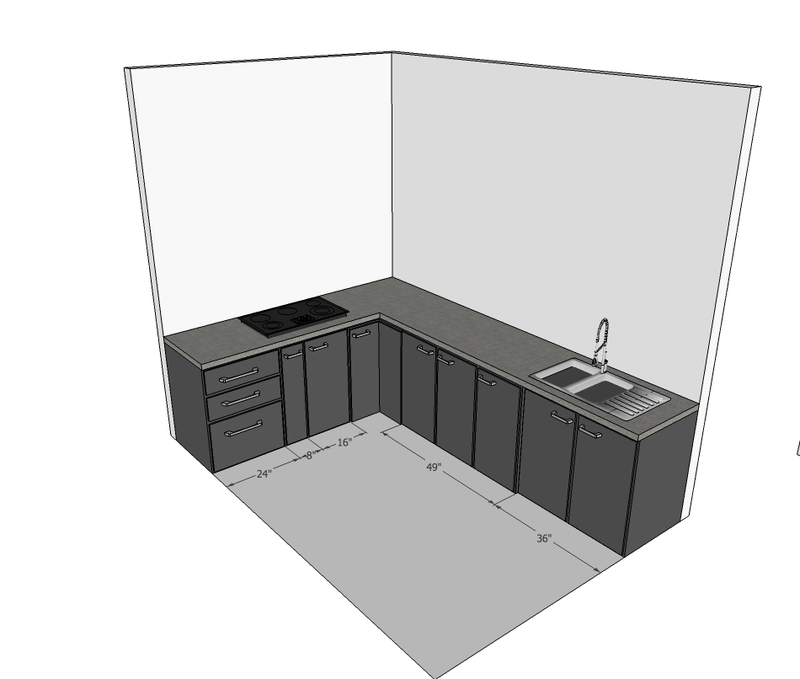 The idea is to fit cabinets into the 4 different spaces given above. Let's fill it up. 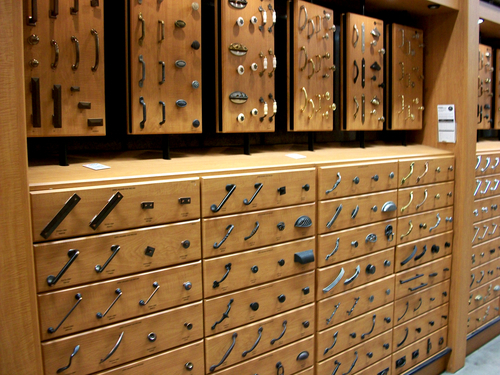 Before we go start filling up these spaces, a few basics on the type of cabinets. 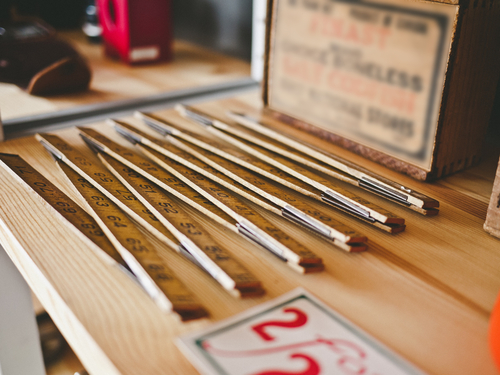 Note that the given measurements are for the cabinets sizes, so the width of the basket, the channels, and the Ply/MDF thickness are added. 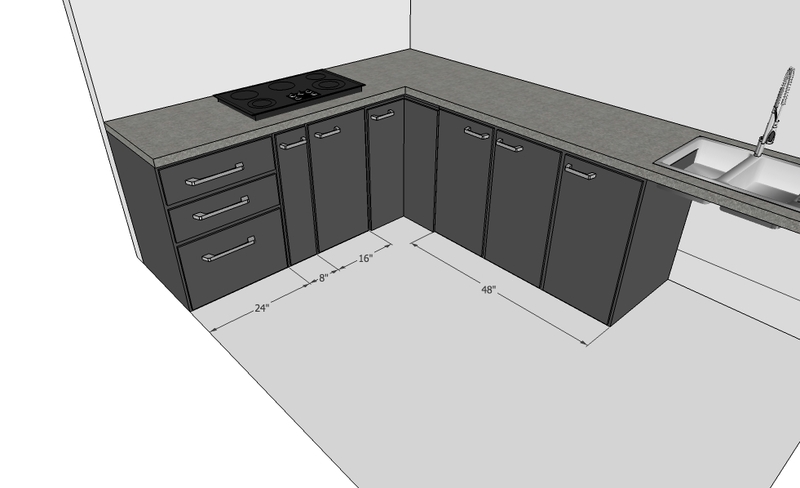 These are 1-door or 2-door cabinets whose size would be decided once the fixed size units are decided. If the size of the space is less than 1.75 ft, we can go for a 1-door cabinet. 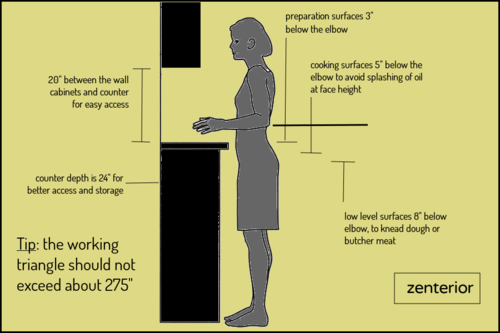 If the size of the space is between 1.75ft and 3.5ft, we can go for a 2-door cabinet. Bottom line is that the size of a door cannot exceed 1.75ft. These are just doors which will cover below the sink. 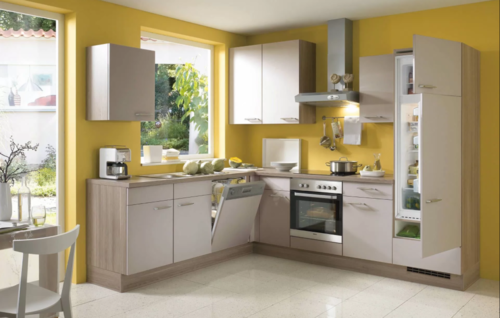 These can be either 1 or 2-door, and the same logic that we used for variable size cabinets can be used. Assuming that we are not going to use the magic corners or any corner accessories, the corner space can be used efficiently by having corner cabinets. 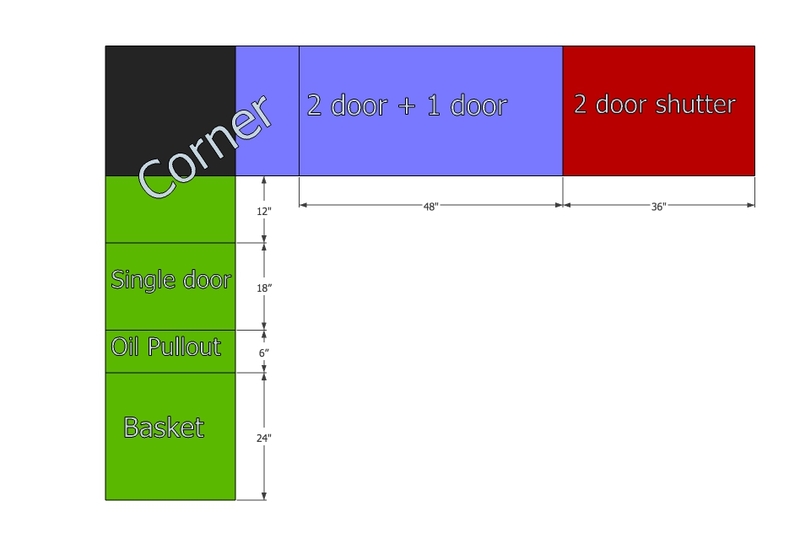 There should be at least 300mm of the door on either side of the corner, to have a usable L-corner. Check out the image below for a sample. 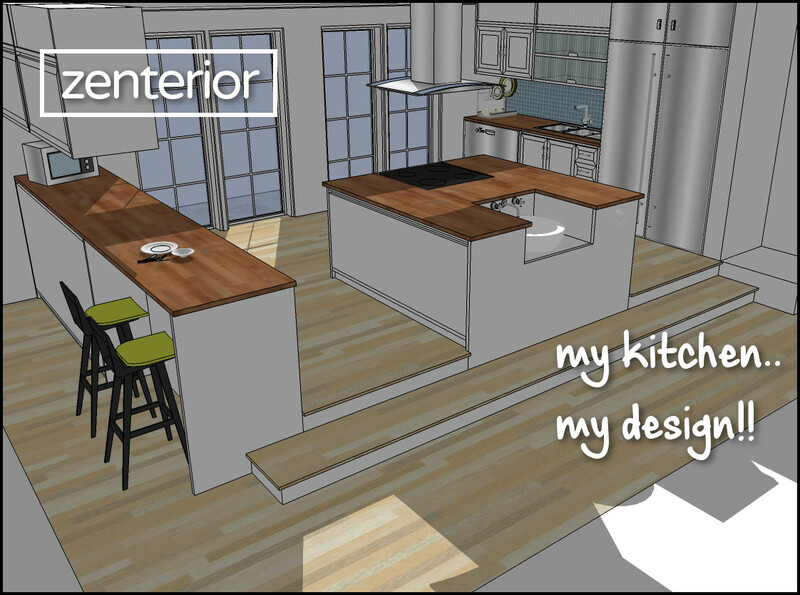 Let's fit some cabinets into the spaces and build our Kitchen. Since this is the side where one will stand and cook, the ideal way is to have at least one set of baskets to store the cutlery/vessels and a bottle pull-out to store the oil etc. Since we have only a space of around 5ft we will have one basket set and a bottle pull-out. You will read below why we cannot have the entire space so that the corner space is efficiently used. The basket and the oil pull-out has been fitted as given in the above diagram. In the remaining 30 inches, we need at least 12 inches (1ft) for the corner unit from this side. So, let's allocate 12 inches to the corner unit and the remaining 18 inches (1.5ft) to have a single door cabinet. This side looks as the given diagram. As mentioned in the above two sections, the corner space will have 2 doors of size 12 inches (1ft) as given in the diagram. In the 5ft space that we have, we need to allocate 12 inches (1ft) for the corner door to go with the corner door on the other side. We have around 48 inches (4ft). We split this as 2-door cabinet (32 inches) + 1-door cabinet (16 inches). Splitting like this makes the door sizes even and gives a better look. The full kitchen looks great now. 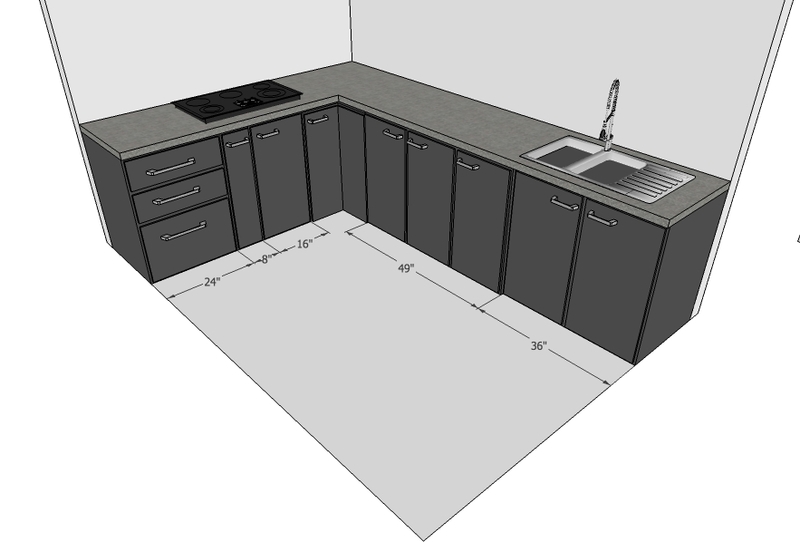 This post covered how you can plan the floor units in your modular kitchen design. 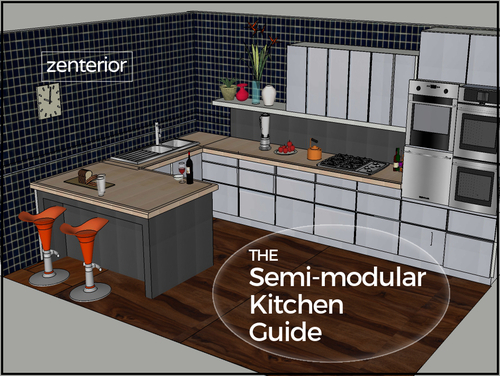 Another post will follow on how to plan your wall units and Tall unit for your modular kitchen design. The post intends to break down the design of the Indian Modular Kitchen so that anybody can take a stab at planning their own kitchen. Or else, they'd be better informed when discussing with other designer/vendor/carpenter. Since there are a lot of information, the part 1 will cover the design of the floor units or cabinets. If you are looking for what color would look better on your wall/floor cabinets, you've already wasted 20 seconds on this page. 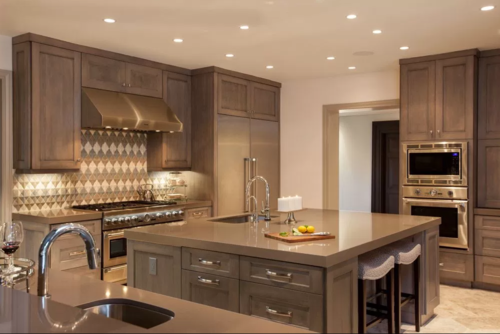 This page helps you plan the space and cabinet arrangements in a practical way. 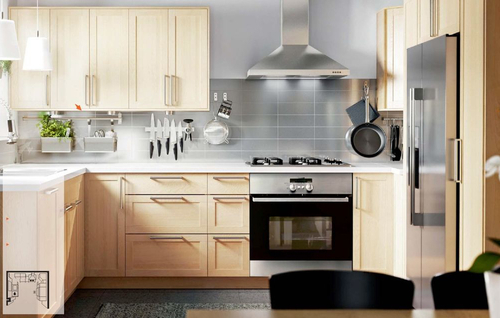 The components in the Indian Modular Kitchen can be divided roughly into 4 parts. 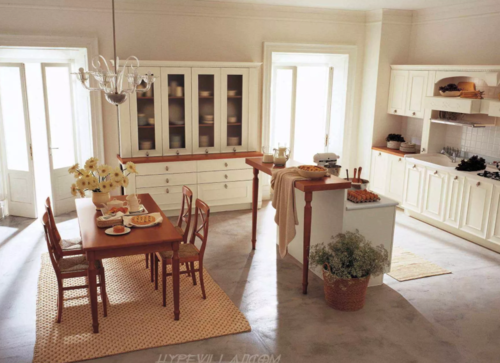 Let's discuss the Floor Cabinets here, and the discussion on Wall Cabinets and Tall Units will follow in the next post. 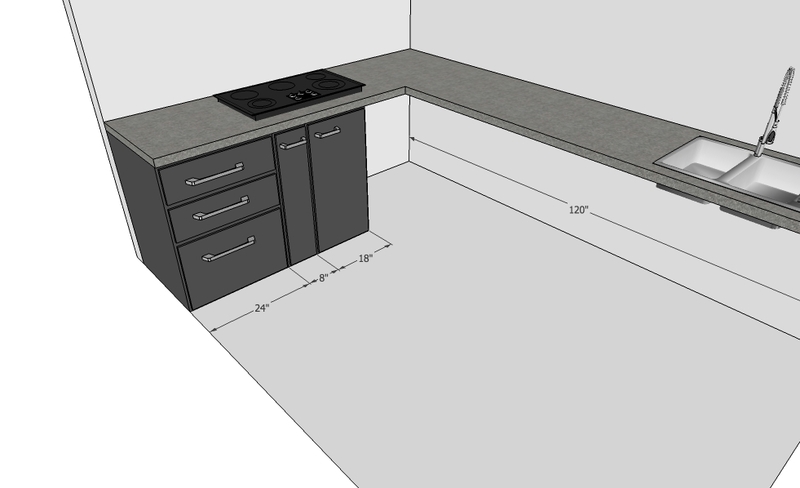 These are the cabinets that come underneath the counter, and the distance between the floor and the counter is usually between 820mm and 860mm (33 to 35 inches). Let's call this Floor Cabinet Space (FCS). 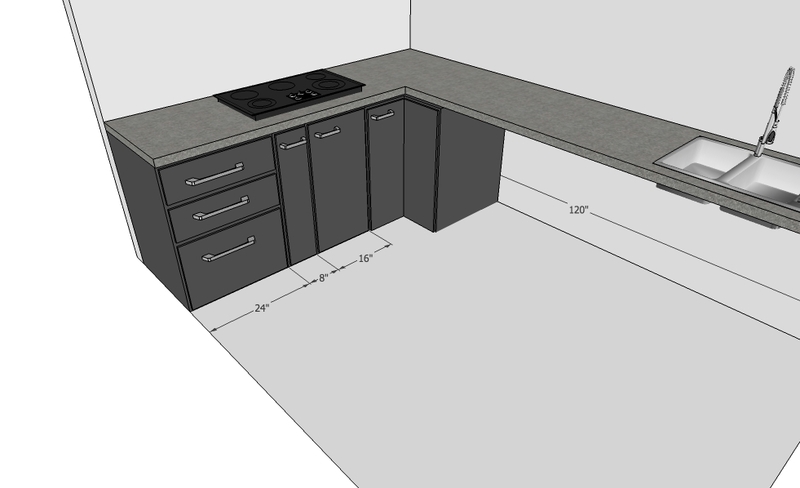 Since all the cabinets have to fit in FCS, the height of all the cabinets will be equal to FCS, with a few minor corrections. 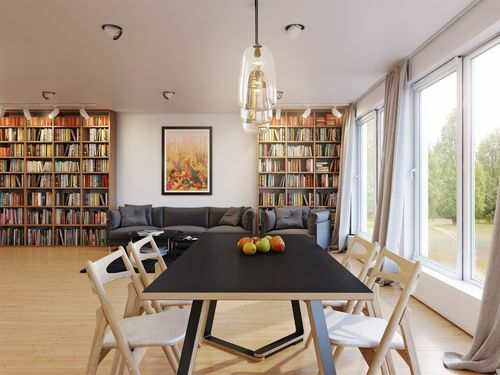 Now, the trick is to come up with the cabinet widths so that they can fit horizontally without wasting any space, and in a way that the cabinets are easily accessible. 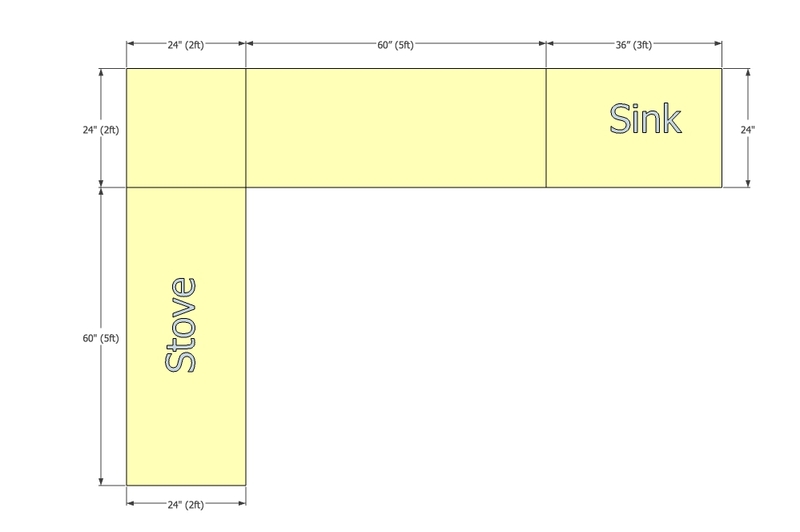 For this discussion, let's take an L-type Kitchen as given below. 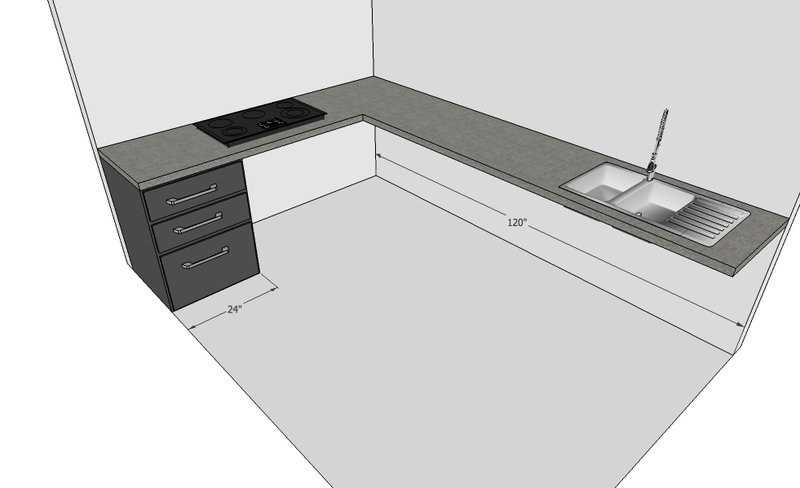 Step 1: Measure the distance length of the counter from underneath on both the sides of the L.